For a long time, the altar of the Portiuncula, in Assisi, was topped with an image representing the Assumption of the Blessed Virgin. But in the beginning of the 14th century, a pupil of Giotto painted Christ in glory and Mary interceding for the people, on the wall behind the altar. This fresco was soon darkened by the smoke from the candles. In 1393, was placed in front of it an Annunciation painted on wood by the priest Hilary of Viterbo. This painting on wood is still venerated today in the chapel of the Portiuncula. Annunciation painted by the priest Hilary of Viterbo. One wonders why, towards the end of the 14th century, the image of the Assumption was abandoned in favor of that of the Annunciation? It must be remembered that medieval Franciscans put much effort into the propagation of the prayer of the Angelus, which commemorates the mystery of the Annunciation. This is the time when the practice of the prayer of the three Ave Maria spread. It is said that St. Anthony of Padua (1195-1231) strongly recommended this practice. St. Bonaventure, meanwhile, introduced this prayer in Franciscan friaries, to honor the Incarnation of the Son of God. The three Ave were recited, the evening after Compline, while meditating on this mystery. Another reason for the abandonment of the image of the Assumption in favour of that of the Annunciation is that the scene of the Annunciation was one of the most often painted themes in medieval Christian iconography. This is why, when he wanted to paint the Annunciation for the chapel of the Portiuncula, Hilary of Viterbo didn’t have to start from scratch. He had several models of paintings of this scene before his eyes. 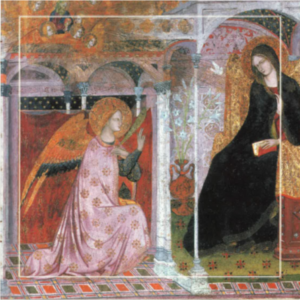 He was greatly inspired by the Annunciation of Simone Martini (1333), which is an iconic masterpiece of Gothic art. This painting of this altarpiece of the Portiuncula introduces us to the mystery of the Annunciation. Mary, sitting majestically on a throne, holds in her left hand the book of Scripture, while the angel Gabriel communicates the happy news that she has been chosen by God to be the Mother of his Son. 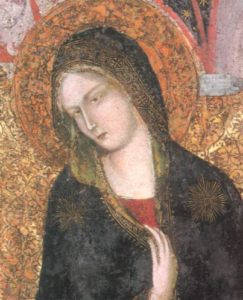 Surprised by the appearance of a celestial being, the frightened Mary shrinks back and looks slightly away. Her delicate and yet dramatic gesture highlights her emotional state. The Gospel of Luke states that Mary is greatly disturbed when she hears the words of the angel. A solemn serenity pervades the entire painting. The White Lily, symbol of purity, expresses the virginity of Mary. The presence of the Dove represents the action of the Holy Spirit which covers the Virgin with its shadow. In the upper left corner of the painting, there is the Eternal Father surrounded by six Seraphim. With his right hand, he blesses the humble handmaid of the Lord.